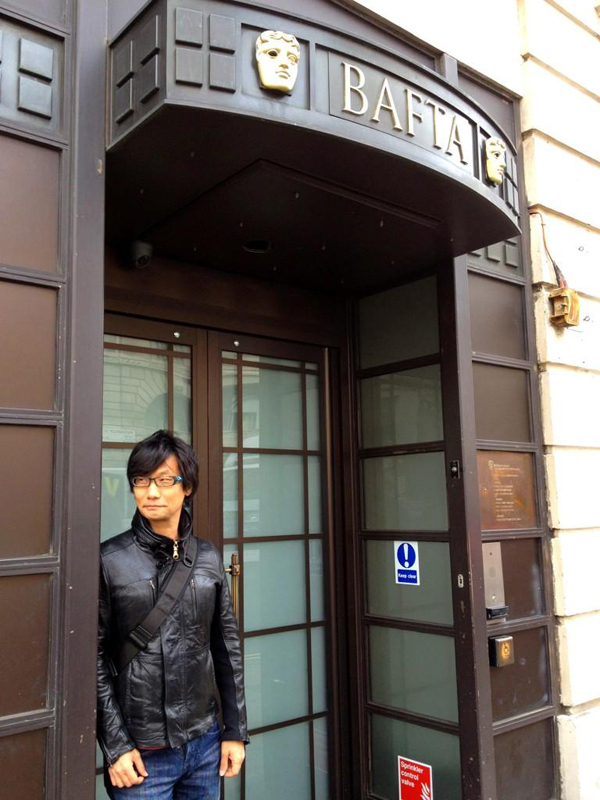 On September 28 Hideo Kojima was in London, where he attended the British Academy of Film and Television Arts, giving a lecture on video game development and talking about his personal career. A video of the interview is now available online. Some of the more interesting parts are written down below. Kojima didn’t expect game hardware to evolve so quickly when he entered the industry 25 years ago, but he is not happy with where it is yet. He still hasn’t been able to create the image he popped into his head 25 years ago, despite hardware getting better, and until he has reached that point he will keep creating games. Kojima thinks that at a certain point games will become truly immersive and you will be able to feel things like temperatures, and smells. And that may be the point when he can realize his original vision. 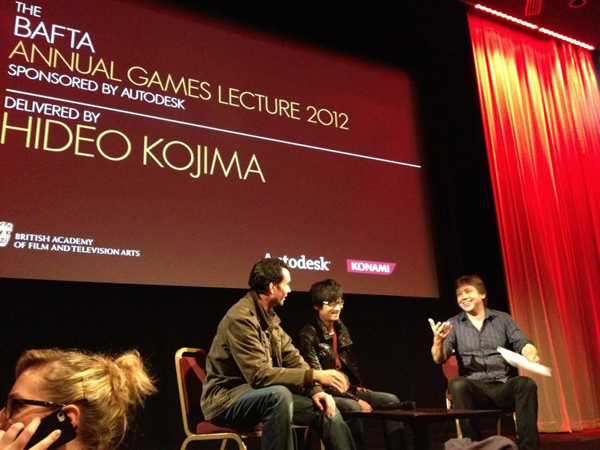 Game design and story are done simultaneously, in parallel by Kojima. Since he works on both himself, he is able to do that and to make one complement the other. The open world system introduced in Ground Zeroes will affect the way Kojima is able to tell stories, due to the increased player freedom, but the type of stories will be fairly consistent. Now that players have more freedom, it’s up to them to create their own story as they play through the game. Kojima thinks that this is something we will see in the next generation of games. Movies based on games haven’t been success stories. Hollywood tries to force a story onto the game when making a movie, when the game it’s being based upon may no have a very compelling story. Kojima wants to tackle this problem with the MGS movie, and believes it will turn out well. Although at this point he can’t think of a good games based movie. Tomb Raider was pretty good… in terms of sales. Most games that are released nowadays tend to be similar to each other. But Kojima does see great potential in the medium. Games are able to achieve something neither movies nor novels can do, it’s a unique form of story telling. Users want that, and it’s Kojima’s mission to provide that for them. Kojima believes that in the future games will become more realistic, and users will be given a lot more freedom. The way of interacting will become more natural. You could say Kojima could be considered an auteur, but this is very unusual for the game industry. From this point on games will get bigger, and tasks have to be split up. For this reason Kojima thinks the auteur is a dying breed in the games industry, and his generation will probably be the last. The original vision for a game comes from Kojima himself (gameplay, controls). He has imaginary personalities in his head, he bounces ideas around in his head, asking himself if he is on the right path. Then he puts a teaser and trailer on the internet and watches the reaction, and makes adjustments from that. He also have people play it at game shows and through demos. But what he doesn’t change is the core gameplay concept, that has to stay true to his vision. If the users don’t like the concept, he just has to throw it away. Because losing sight of original vision is the worst thing that can happen, according to Kojima. Kojima was never able to beat the NES version of his first Metal Gear game. This version was not made by Kojima, and he considers it a butchered game. He once bought it from a bargain bin, but he couldn’t get past a bunch of Dobermans, and got frustrated to the point that he never played it again. He also thinks it’s ridiculous Metal Gear isn’t even in the game, but instead there is a computer screen. Female characters in the Metal Gear universe are mainly based on Kojima’s ideal: intelligent career women who are also able to express a lot of emotion. Rose on the other hand was based on actual people Kojima knew, but she wasn’t very popular. Rose calls you up during the mission to ask what day it is, and this actually happened to Kojima. Being a father changed Kojima, he creates something not just for himself, but for the next generation. He wants to have a positive influence on them. He wants the player to not just be killing time and having fun with a game, although this is important as well, but he wants the game to somehow be useful for the next generation. Being a father changed his perspective on things, and also what he puts in his games. Aside from Raiden, the only character who could take the role of Snake as a protagonist in future Metal Gear Solid games is The Boss. She wasn’t created with the idea of her being a protagonist in mind, but she turned out to be very popular with the fans.